The National Eye Institute / National Institutes of Health have conducted various studies on the use of lasers in treating open angle glaucoma. They determined that lasers are both a safe and effective treatment for this type of glaucoma. 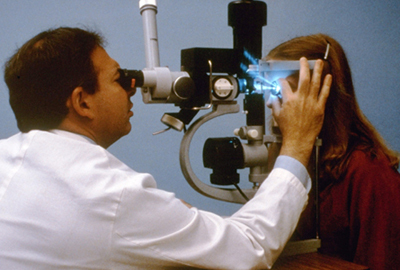 As a result, the use of lasers has become an important part of controlling glaucoma. Argon Laser Trabeculoplasty (ALT) was the most common laser treatment for open angle glaucoma. If medication is ineffective in maintaining your eye pressure, or if for some reason you are unable to take or tolerate medication, this type of laser surgery can be an effective treatment. Selective Laser Trabeculoplasty (SLT) is now the most common laser treatment option for glaucoma patients. During the procedure, your highly skilled glaucoma specialist will numb your eyes with anesthetic eyedrops. A special lens will focus the beam of light onto your eye. You will feel little or no pain, although you will notice flashes of bright light. Some patients may feel a sensation of heat during the treatment. The laser beam is focused on the drainage angle of the eye, and helps open the fluid channels by making 80-100 tiny burns in the trabecular meshwork. The treatment is performed on half of the meshwork at a time. This prevents over-correction of your problem, and the other half can be treated at a later date. In addition, the surgeon can only treat one eye at a time. According to the Glaucoma Research Foundation, laser trabeculoplasty is effective in reducing eye pressure in up to 75 percent of the patients treated. ﻿Selective Laser Trabeculoplasty (SLT) uses a targeted approach in which the laser is applied to selected portions of the trabecular meshwork. Recent studies have shown that both ALT and SLT are effective means of reducing intraocular pressure, with SLT causing less scar tissue formation. Laser trabeculoplasty takes about 15 minutes. You will see your surgeon again within a four to eight (4-8) week timeframe. This follow-up is essential to monitor your eye pressure. Your eye may be red and irritated, and your vision may also be blurry. These symptoms will usually disappear over the next day or so. You will not be able to drive home following the surgery. Therefore, you must arrange transportation. Most patients are able to resume their normal activities the day after laser surgery. You may also need to continue taking some form of medication following the treatment. This is necessary to maintain your intraocular pressure. You should know that laser surgery is still surgery and carries some risks. In some cases, there can be a short term increase in your eye pressure. Medications can help minimize this risk. Some patients may develop cataracts as a result of the laser treatment, although the risk is small. The potential benefits of the surgery in protecting the ocular nerve outweigh these risks.